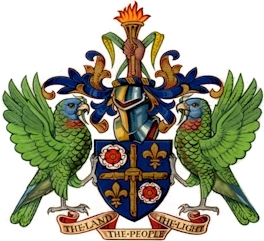 The Motto: " The Land, The People, The Light"
The Coat of Arms of Saint Lucia is the official seal of the Government of Saint Lucia. It may not be used or reproduced in any form without the approval of the Government. Elizabeth the Second by the Grace of God the United Kingdom of Great Britain and Northern Ireland Our other Realms and Territories QUEEN, Head of the Commonwealth, Defender of the Faith, to Our Right Trusty and Right Entirely Beloved Cousin Miles Francis, Duke of Norfolk, Companion of Our Most Honourable Order of the Bath, Commander of Our Most Excellent Order of the British Empire, upon whom has been conferred the Decoration of the Military Cross, Earl Marshal and Our Hereditary Marshal of England, Greeting! WHEREAS for the greater honour and distinction of Our Territory of Saint Lucia We are desirous that Armorial Bearings should be assigned for that Territory. KNOW YE therefore that We of our Princely Grace and Special Favor have granted and assigned and by these Presents do grant and assign the following Arms for Our said Territory of Saint Lucia, that is to say: Azure two sticks of cut bamboo in Cross surmounted of an African stool of authority Or between in dexter chief and sinister base a Rose Argent charged with another Gules both barbed and seeded proper an in sinister chief and dexter base a Fleur-de-lis Gold and for the Crest upon a Helm with a Wreath Orand Azure in front of two Fronds of the Fern Polypoduim in Saltire a Cubit Arm proper the hand holding erect a Torch Gold enflamed also proper and for the Supporters on either side a Saint Lucia Parrot commonly called Jacquot (Amazonaversicolor) wings elevated and addorsed and in the beak of each a Frond of the Fern Polypoduim all proper and for the Motto: THE LAND-THE PEOPLE-THE LIGHT as the same are in the painting here unto annexed more plainly depicted to be borne for Our said Territory of Saint Lucia the whole according to the Laws of Arms. OUR WILL AND PLEASURE therefore is that you the said Miles Francis, Duke of Norfolk to whom cognizance of matters of this nature doth properly belong do require and Command that this Our Concession and Declaration be recorded in Our College of Arms to the end that Our Officers of Arms and all other Public Functionaries whom it may concern may take notice and have knowledge therefore in their several respective Departments. in the Twenty-seventh year of Our Reign.